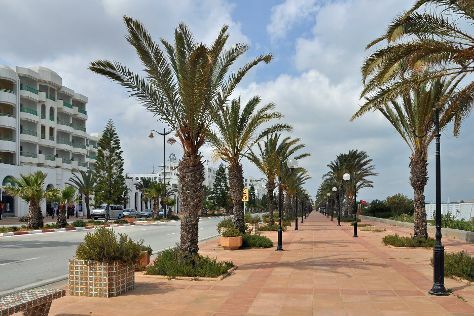 Known for its imposing 8th-century fortress, the coastal city of Monastir offers visitors pristine beaches, a scenic waterfront, and a number of historic buildings to admire. On the 21st (Sun), explore the historical opulence of Forte El Ribat, contemplate the long history of Bourghiba Mausoleum, then take an in-depth tour of Sousse Archaeological Museum, and finally contemplate the long history of Medina of Sousse. You can plan Monastir trip in no time by asking Inspirock to help create your itinerary. Mumbai, India to Monastir is an approximately 17.5-hour flight. The time zone difference when traveling from Mumbai to Monastir is minus 4 hours. Traveling from Mumbai in April, you will find days in Monastir are cooler (26°C), and nights are little chillier (17°C). Finish your sightseeing early on the 21st (Sun) so you can drive to Hammamet. Kick off your visit on the 22nd (Mon): make a trip to Medina of Hammamet, then wander the streets of Yasmin Hammamet, and then tour the pleasant surroundings at Hammamet Beach. To see other places to visit, reviews, ratings, and tourist information, you can read our Hammamet day trip planning website . Getting from Monastir to Hammamet by car takes about 1.5 hours. Other options: take a train; or take a bus. In April, daily temperatures in Hammamet can reach 27°C, while at night they dip to 14°C. Wrap up your sightseeing on the 22nd (Mon) early enough to travel back home.